The Alex Jones trial won’t set any legal precedents. Alex Jones’ trial isn’t legally significant. But it’s still culturally terrifying. 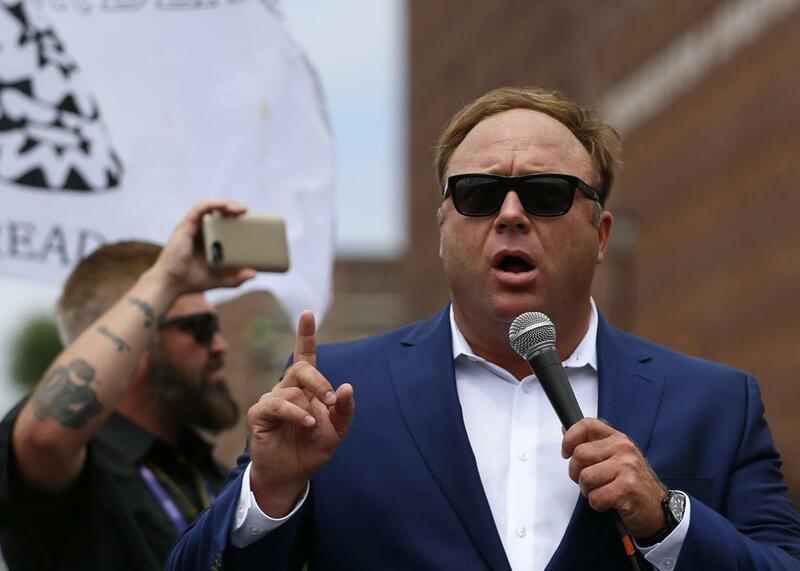 Alex Jones from Infowars during a rally in support of Republican presidential candidate Donald Trump near the Republican National Convention in Cleveland, July 18, 2016. The Alex Jones custody case unspooling last week and this week in Austin, Texas, is many things. It is a spectacle, a human tragedy, and an hourly reminder that America is mostly goddamn horrifying. What it is not—with all due respect to BuzzFeed’s Charlie Warzel, who has been covering the living heck out of the proceedings—is the 21st Century equivalent of the Scopes Monkey Trial. There is nothing interesting on trial here. Competing views of parenting aren’t on trial, nor is any important legal principle, and no interesting legal precedent will result. The only lodestar of any child custody case is the best interest of the children, and in this case, too, the battle is not between media narrative and celebrity culture or the boundaries between a public self and a private self: It’s a contest between which of two seemingly very flawed parents will be less terrible for their children, and which custodial arrangement will screw them up the least. That doesn’t mean this whole enterprise isn’t a must-see cultural meditation on vitally important issues of the day. Todd Gitlin probes one such question here: Doesn’t Jones’ claim that he is a mere performance artist (he both embraces and rejects that characterization on the witness stand) perfectly mirror Donald Trump’s incessant claims, often after the fact, that his most explosive statements were “jokes” or “sarcasm”? Gitlin ascribes the ability of both Trump and Jones to dismiss whatever they say as part of our “no accountability culture.” This culture ensures that anyone who can claim legions of passionate listeners and fans is granted the imprimatur of having something important to say. Trump is a huge fan of Infowars; he has been known to peddle some of Jones’ nuttiest theories, and has called Jones and his show “amazing.” It shouldn’t be surprising to see Jones straddling Trump’s say-it-deny-it-excuse-it strategy, even as he stands to lose custody of his own three children. Trump has taught America a master class in the consequences of no-consequence speech acts—oh and the lesson is that sometimes you end up president. There is no cognitive dissonance, ultimately, between the claim to be performing as a persona and the claim to be offering valid information or—and this is Infowars’ central product—a hermeneutic of radical suspicion. Jones insists that it’s the latter that is urgently needed: trust no one, investigate everything. Thus, Jones, in performing an act in which he pleads for his audience to be wary of people performing acts, is just closing the loop, offering evidence of that which he preaches. This isn’t hypocrisy: it’s instantiation. In Dew’s telling, the American left still clings to “a Protestant model of private human depth, wherein there is an active intellectual inner life, debating and discerning, before one speaks or writes or acts in public.” This model has been dismantled by Trump, and Jones, and others who claim that performance acts of “liberated speech”—untethered from reflection or conviction or reality—are the truer models of sincerity. One lighthearted moment: Court official refills water pitcher. What Alex Jones is doing here isn’t an attempt to reconcile his public persona with his private role as a dad, and I suspect the media is wrong when it insists that’s what this trial is about. What he is doing is of a piece with what Trump does and Jeff Sessions does and Sean Spicer does every day: He is deliberately destablilizing core American institutions of truth. It’s his word that’s sincere, not the lawyers’. It is Spicer’s words that matter, not the lying liars. It’s what Trump knows in secret that is true. Everything else is a con. When you listen to Alex Jones tell his listeners that the mainstream media is full of lies, or that the lawyers in the case are “twisting things” and “have no decency,” what he is doing is saying that the news about him is fake. It doesn’t matter that this fake news is being deployed to protect Jones’ interests in court—because in case you missed it listeners, the court is fake, too. This centuries-old system for testing facts in an adversarial fashion before neutral fact-finders? It’s a crock. In Jones’ telling the point here is to foment distrust and paranoia, and he is using the court proceedings themselves to do just that. If Alex Jones wins custody, the courts and lawyers and the media will be co-conspirators and liars. And if he loses? Um. The courts and lawyers and the media will also be co-conspirators and liars. The point of this litigation is not to ever get to the point of litigation. It is to persuade people that the trial is the show, and his authoritative and lucrative radio performance is what’s real. Nothing that happens at this sad little custody trial will be any kind of lasting judgment on any meaningful truth about the nature of Jones’ character. He’s already told us, again and again, that his character is his truth, in the instant it’s expressed. This is not a referendum on the press or on the courts. Nothing at this trial will establish any facts about the Jones marriage or their children’s needs, and when the chips fall, all we will know as a purely factual matter, is who was deemed by a rigged system to be the better of two poor options to serve as guardian of three children.